Sculptures by Marika and photographs by Dennis Martin are on display at the Guadalupe Regional Medical Center Artist Wall through December 2013. This is your opportunity to see sculptures that are on public view for the first and possibly the last time; they are on loan from private collections. Also, The Contortionist is on view for the first time. In addition to the Artist Wall, the medical center has two of Marika’s sculptures in their permanent collection. Maternitree is at the entrance to the Birthing Center and the Cross of St. Bridget is in the chapel. We hope you enjoy the exhibit. 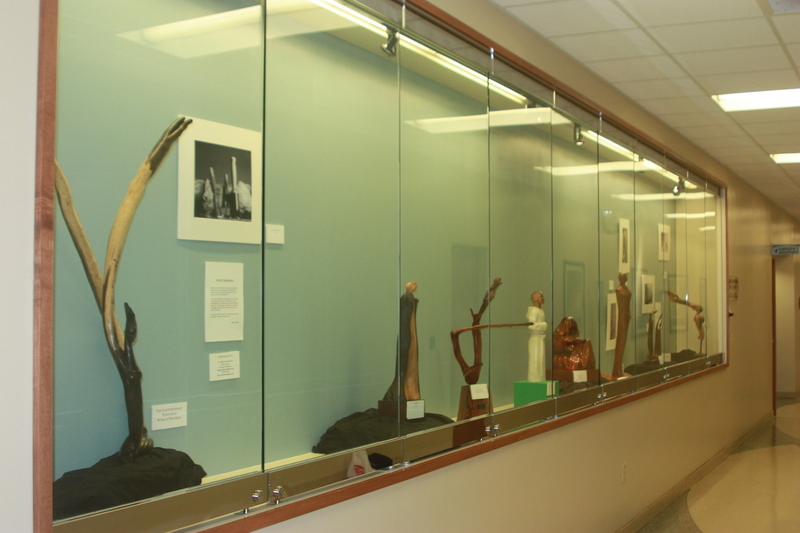 This entry was posted in Commission, Fine arts, Marika's Exhibits, Sculpture, Sculpture Exhibition, Sculpture medical center, Seguin Art, Seguin Texas, St Brigid's Cross and tagged Dennis Martin, guadalupe regional medical center, marika, marika bordes, sculpture hospital, Seguin Art, wood sculpture exhibition. Bookmark the permalink.